Our Sealed Air Instapak expanding foam packing offers a lightweight void fill, clean and professional packaging material to safeguard goods while in transit or storage. Flexible and easy to use, the Sealed Air Instapak bags save time as it can easily be activated to form cushions that are custom-fit to your products. To use the expanding foam packaging, which comes in four sizes, you simply apply pressure to the foam bag’s panel and gently pat it to expand the foam. Put the expanded foam in the storage or shipping box, place the product into the foam cushion and repeat the process to form a top cushion. Instantly produce your own moulded foam packing with our clean, self expanding sealed air bags. No additional equipment is needed, and because it’s supplied flat, the sealed air bags require only minimal storage space. Choose from our four available sizes (380 x 460mm, 460 x 460mm, 460 x 610mm, 510 x 760mm) which come in packs of 10, ready to be used by anyone at any time. The Instapak RT bags are supplied unexpanded, with each pack containing almost a room full of packaging. They are simply activated by pressing to release the foam which sets around your product to create customised void fill and protective foam packaging. The sealed air foam expands to mould around your item, giving a perfect packaging fit and moulded cushion, and can be reused for the same product. 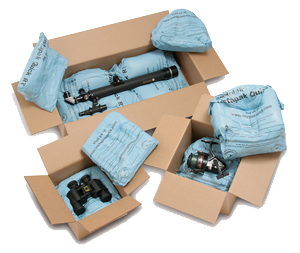 Use our Sealed Air Instapak RT expanding foam packing to pack up and move delicate or electronic goods such as cameras or microscopes as it provides a cushion against bumps, gives a smart appearance, and being lightweight saves on shipping costs.